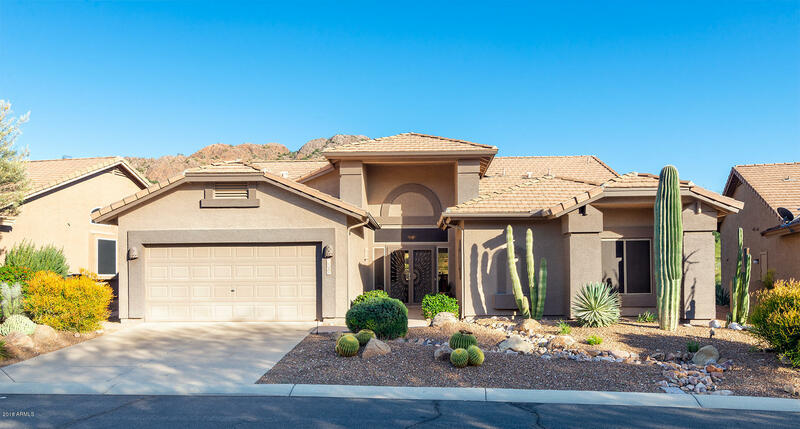 Excellence best describes this incredible residence revealing an impeccable open concept with spacious greatroom & savoring gorgeous mountain views! Capturing a perfect indoor/outdoor lifestyle. the interior flows to the covered patio with built in BBQ, heated pebble-tech pool all accentuated by the beautiful Sonoran desert landscape! Flex your culinary skills in the newly redesigned kitchen with state of the art stainless appliances, double ovens & finished with granite counters! 22'' diagonal porcilan tiled flooring is throughout the home except master retreat! Beautiful ensuite with tiled shower, dual sinks, large walk-in closet with custom built-ins! The 2nd master features completely remodeled bath opening to large guest bed with walkin closet. Beautifully maininted home with new HVAC system, water softner/heater and additional insullation added in 2018. This home offers a 2 car + golf cart garage and a 3rd bay can be added. Nothing to do in this TURN KEY FURNISHED HOME!